Arguably the biggest challenge facing the human race in the 21st century is education, yet few organizations have given this as much thought and analysis as the Center for Curriculum Redesign. What does every child need to know in this age? Our system of education hasn’t changed significantly in centuries, yet the knowledge, skills, and character needed now are fundamentally changing. I highly recommend this book to anyone who cares about the future. It is insightful, comprehensive, global, and coherent. It will set the compass direction for the next generation. 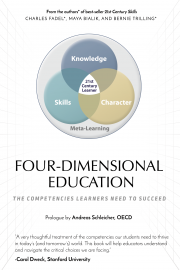 Four-Dimensional Education offers a compelling vision for transforming education and how we look at education. In a global economy, driven by nimbleness and innovation, it is increasingly clear that success depends on the transformation of education system. 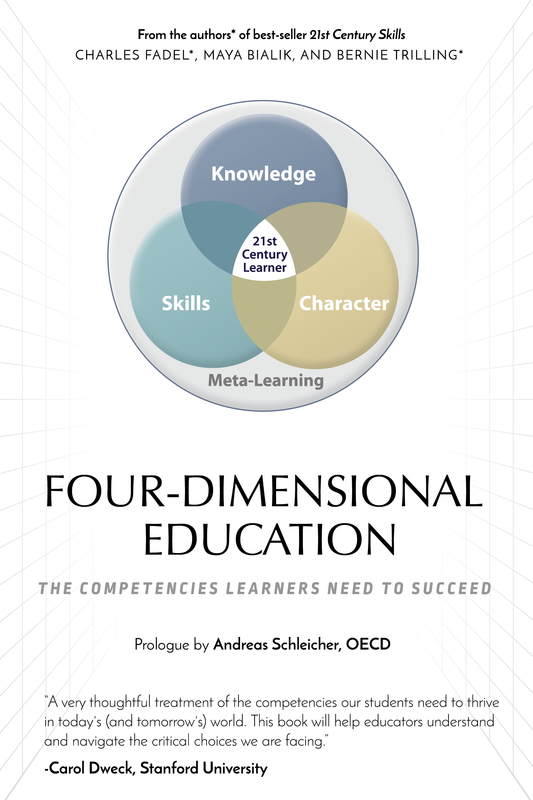 This book challenges us to redefine what we mean by success at all levels of the education system from the foundations of K-12, to the entrance requirements for higher education, to what the workforce can and needs to be. Why a New Education Framework? Maya Bialik is a writer, editor, and research synthesizer at CCR, who is passionate about appropriate interpretation and the application of science at the personal and the policy levels. She is also co-founder and associate director of thepeoplesscience.org, a non-profit that improves the relationship between science and society. She leads workshops on science communication, improvisation, and interdisciplinarity. Maya holds a Master’s degree in Mind, Brain & Education from Harvard, and her background includes research and writing in complex systems, education, environmental science, psychology, neuroscience, and linguistics. Follow her on twitter @mayabialik. Bernie Trilling is founder and CEO of 21st Century Learning Advisors and the former Global Director of the Oracle Education Foundation. He has served as board member of the Partnership for 21st Century Learning (P21), co-chaired the committee that developed the P21 rainbow-learning framework, and is currently a P21 senior fellow and an American Leadership Forum senior fellow. He was director of the Technology In Education group at WestEd, a U.S. national educational laboratory, and was executive producer for instruction at Hewlett-Packard Company, where he helped lead a pioneering global interactive distance-learning network. Bernie co-authored 21st Century Skills: Learning for Life in Our Times and has written chapters for books such as the Deeper Learning: Beyond 21st Century Skills collection. He is a featured speaker and workshop leader at numerous educational gatherings. 100% of the net proceeds will help CCR’s mission.